Day-to-day tasks are more connected, automated, and optimized than ever before and shopping is no exception. Demand for digital commerce is creating a retail future where needs can be instantly communicated and instantly met. To keep customers coming back, physical retailers must leverage the local connection to the consumer while still evolving. Catapult® WebCart™ is a revolutionary click-and-collect solution that allows brick and mortar stores to step seamlessly into the digital realm. Click and Collect 2.0 represents a next generation approach to retailing, the ability to complete a transaction online, and receive the same dynamic transactional experience when shopping in the store, no matter how complex the transaction. No matter where your shoppers are or how they wish to communicate their needs, Catapult’s single platform solution is able to accommodate the sale and provide up-to-date data in real time. Whether online or in-store, shoppers will have a captivating experience that will keep them coming back. WebCart can execute any promotion or pricing scheme, no matter how complex, just like a transaction that occurs in the store. Customer loyalty rewards work online too, just as your customer would expect. After submitting orders through WebCart, shoppers can pay for their goods securely online, in-store, or at the drive thru. When making a web order, credit authorization tokens gathered while shopping at the store can be used. Shoppers can review past purchases made online or in the store. Baskethub, a consumer mobile app, allows customers to be notified of available promotions, view e-coupons, and keep track of punch card rewards at WebCart-ready stores. Online items can display nutritional information, ingredients, and attributes such as Gluten-Free, Vegan, and Local using the same label/coding system as in the store. Blazing-fast item lookups make baskets sizes bigger and keep time-conscious customers coming back. 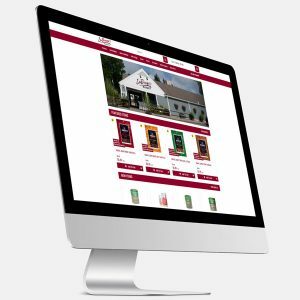 A well-run online storefront takes care of customers with the same zeal and attention that your associates aim to provide in your physical store. When you implement WebCart as your click-and-collect solution, you’re not simply getting a solution but an engine for opportunity. WebCart opens a new and accessible avenue to promote positive customer interactions and boost your profits. Real time inventory synchronization between “brick” locations and “click” storefronts prevents oversells, price discrepancies, and missed sales opportunities. You will never have to re-ring an order at a POS station. For example, whenever substitutes and or item corrections occur during the picking process, the system automatically re-transacts. Routes attendants through the grocery order pick using the most efficient path through the specific store location. The attendant can also pick multiple orders at once, allowing for a single pass through the store location. Automatically alerts the customer with text or email when their order has been picked and is ready for pickup. Keeps track of where each bag, within a specific order, is located within the store. For example, bagged frozen items might be kept separate from produce items, until the moment the customer is ready to pickup. WebCart is a vital part of the single platform solution that ECRS provides to our community of retailers through Catapult. If you’ve decided to take your first steps into the larger world of online retail, we’ll be with you on the journey to ensure easy implementation. Use Catapult Web Office to manage your WebCart store and Catapult POS or a mobile terminal for handling customer orders. Because WebCart utilizes bi-directional synchronization, prices, product information, sales, rewards, and customer data are the same online and in-store. Use your own branding, graphics, advertisements, promotions, and menu preferences to keep a consistent store image. Launching a new WebCart site is a breeze, compared to a traditional Web store solution. The system automatically configures itself, based on the item data within Catapult’s item management system. When you’re part of the ECRS User Community you have free access to free content found in the ECRS UPD (Universal Product Database) which has information on nearly half million item records. This can include product images, ingredients, and even supplier catalog data.